Headed for the corrals - and the trailer ride home! For the last 5 or 6 years, we've hosted workshops during our shearing day (as part of our Shepherd Skills Workshops). 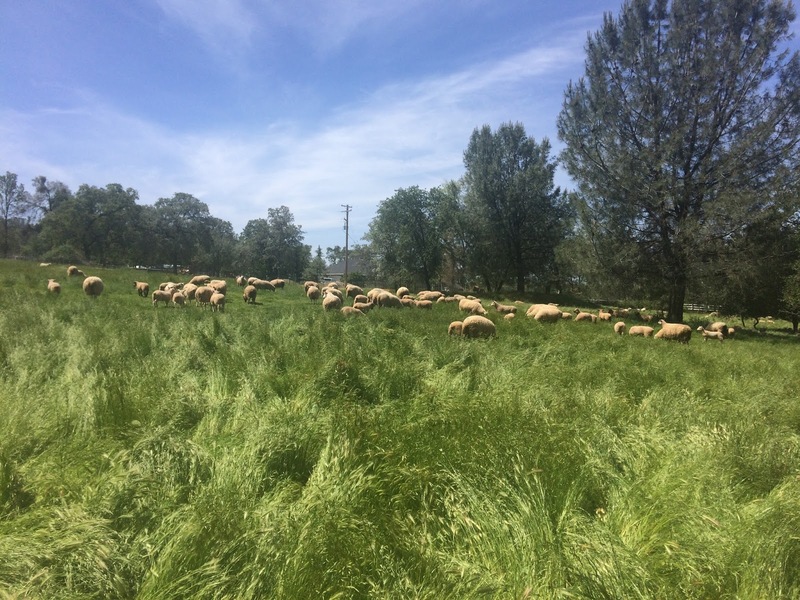 Unlike our larger-scale friends, we don't have enough sheep to justify hiring a shearing crew; unlike many of the small flocks in our community, our operation is big enough to require some careful preparation. Since most of our students show up the day that we shear, I thought it might be helpful to walk through the preparations that lead up to shearing the sheep, as well as the steps we take to prepare our wool for market. While wool is not the most valuable product we sell from our sheep, we do take a few steps to ensure a quality wool clip. First, we've declared war on baling twine - as baling twine breaks down, it can shed small pieces that contaminate wool. We also try to avoid grazing the sheep in cocklebur in the late summer and fall - these burs can ruin wool (and our shearer's hands). 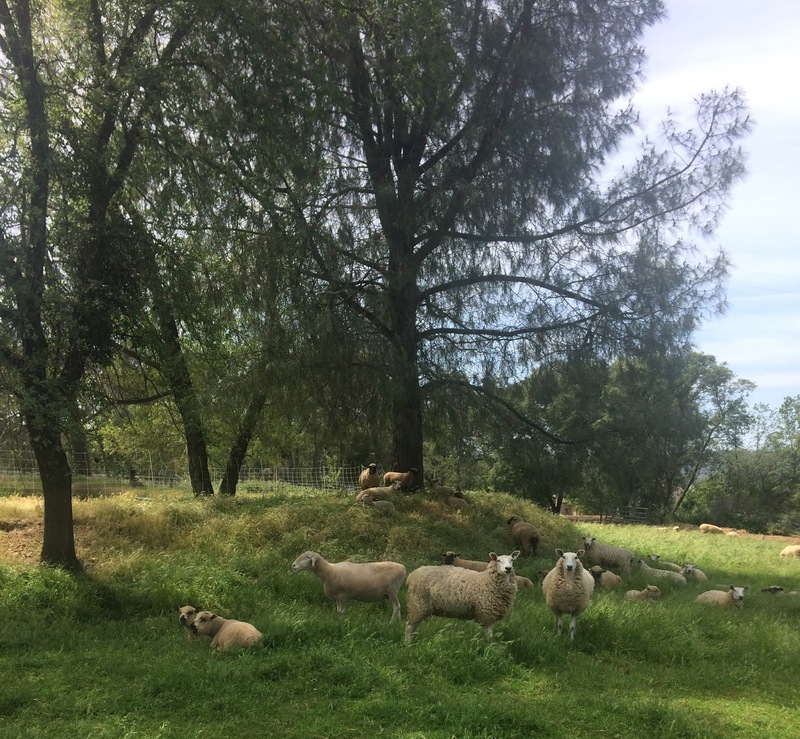 Since we lamb in the springtime, we wait until the youngest lambs are 5-6 weeks old before shearing (ewes in early lactation are more difficult to shear) - which means we try to avoid maturing filaree (the corkscrew seeds can also contaminate the wool. While we think about wool quality all year, our shearing preparations generally begin with a call to our shearer in late March. Our friend Derrick Adamache has sheared our sheep since we got started with wool sheep 12 years ago. 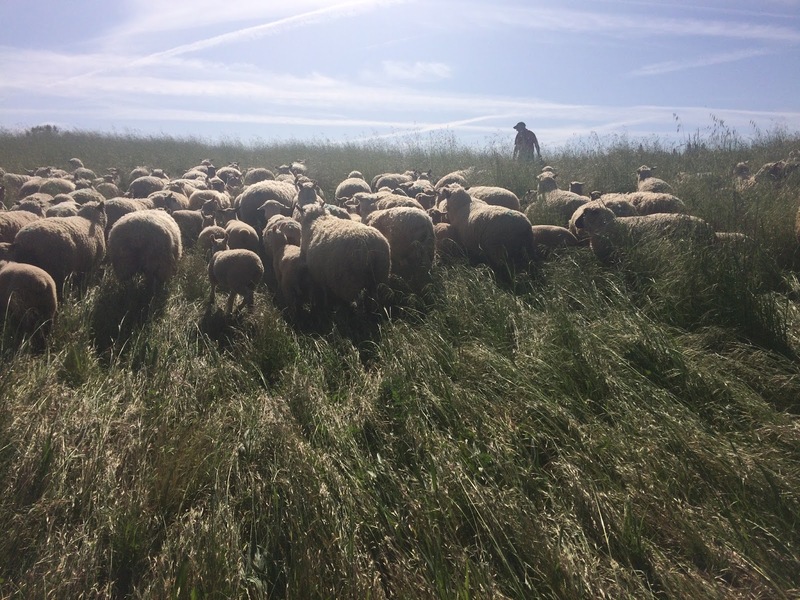 When we reached our peak flock size prior to the drought, our shearing lasted two days; now, with a smaller flock, Derrick can generally finish in a day. 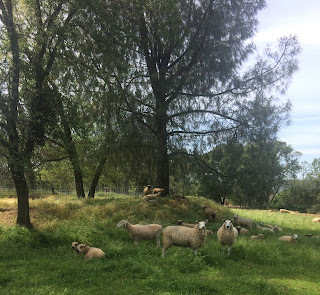 While I do a bit of shearing myself, I've found that shearing day is much smoother when we hire a professional - and when I can pay attention to managing the rest of the day's work (which I've outlined below). I should probably include a brief discussion of what I look for in a shearer - and what shearers expect from their customers. I want someone who will handle my sheep like I handle them - I've never worked with a shearer who is rough on the sheep and wouldn't tolerate someone who was. By the same token, I try to take care of Derrick. I make sure all he needs to do is shear the next sheep. Since he charges by the head (rather than by the hour), I want to make sure he's never waiting on us. I make sure he's got a level place that's out of the sun to shear. I provide lunch (and breakfast if he stays the night). And while I don't know if this is customary, I always give him half a lamb in the fall. Shearing is incredibly hard work; it's important to keep the shearer happy! Once Derrick confirms a shearing date (which is typically around Mother's Day weekend), I call our feed store to order wool sacks. The crews that shear for large-scale operations often bring their own wool grader and hydraulic press - they sort fleeces and bale them in square wool packs. As a smaller operation, we still use the old burlap "sausage" packs - six-foot burlap bags that we suspend from a homemade stand. With our sheep, we can typically get 25-30 fleeces in a sack, so I order accordingly. Gathered into the portable corrals. 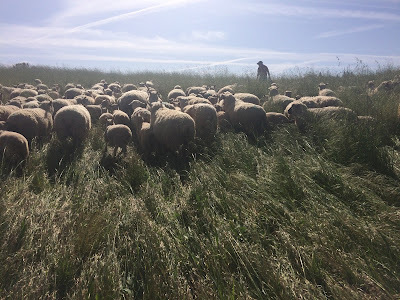 For the last several years, we've sheared the sheep at our home place - which requires us to haul all of the sheep home the week before we shear. I dream of walking the sheep the 2.5 miles from our leased ranch, but I'm fearful of impatient drivers on our decreasingly rural county road. This morning, we set up our portable corrals and hauled the entire flock home. The next task will be to haul the rams home and keep them isolated from the rest of the flock. This always takes a bit of juggling - complicated this year by the fact that several other producers will be hauling their sheep here to be shorn as well. The rams will probably live in the gooseneck trailer while they're home. On Friday evening, I'll set up a sorting system in one of our horse paddocks. The horses will go out to pasture; the sheep will come in to the dry lot overnight. We sort the lambs from the ewes while we're shearing; lambs will be shorn later in the summer. We hold the sheep off feed and water for at least 12 hours - empty rumens and bladders make for more comfortable sheep in the 75 seconds Derrick has them in the shearing board. 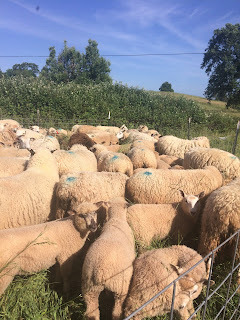 We'll bring 16-24 ewes into the holding stall in the horse barn - this gives us a two or three pens worth of sheep that will be dry first thing in the morning (in case we have a heavy dew). Derrick shears for us in a bullpen set up. That means we bring 8 ewes into a 12x12 foot stall. Derrick catches each ewe in turn; when he's caught the last ewe, we let the first 7 go out to rejoin their lambs. We repeat this cycle until the entire flock is shorn. Depending on where we're sending our wool, we may skirt the fleeces (remove manure tags and vegetative contamination). This year, we're hoping to sell our wool locally, so we'll set up our skirting table. We also put canvas tarps down in our shearing yard to the wool from getting additional vegetable matter in it. I'll set up our wool sack stand - an ancient homemade stand that was given to us by our friend Ann Vassar. I'll dog-ear the bottom of the first sack (for handles) and hang it on the stand. Then we're ready to start! We save our grass at home for this week! My next entry will describe shearing day itself - stay tuned! By Friday, they'll have this grazed down.